East Kent Road Car Co Ltd. bought this smart unique vehicle into the fleet at the start of the 1960’s, this was a common sight with the coach touring fleets around the country but for East Kent, this was a one off. A Ford Thames Trader 570E #510E34629 with Harrington #2147 C41F body was new in January 1960 to supplement and update its excursion fleet (1xBedford OB; OKE 470 & 2x Bedford SB; GFN 600/1) on the Isle of Thanet, but this work began to wain and TJG 440 found itself regularly working the express runs to London. 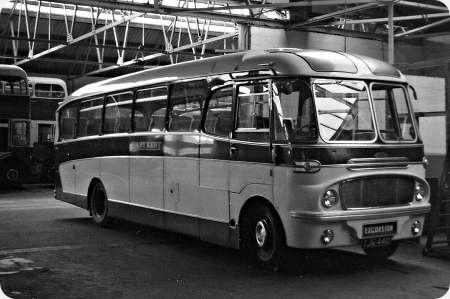 This vehicle was an elegant looking coach and stood out against the regular "boxlike" London express vehicles of the TFN & WFN batches which East Kent used at the time. This view taken in the works section at the back of Westwood depot, in pristine condition and ready for another excursion around the countryside depicted in "The Darling Buds of May", the Garden of England. What other rare, unusual or odd looking pictures of PSV’s do you have out there, I look forward to seeing some more very special photos. This is certainly an interesting variation, Ron, of the ‘normal’ Cavalier body. I’ve never seen one like this, with a gentle slope forward of the emergency door. Thanks, lovely to see another old picture of my bus! I’ve looked back at my records and have found that I saw this coach at Walton on the Naze on August 28th 1975 while it was with Viceroy but sadly I didn’t take a photo. Please don’t tell me that was forty years ago because that would make me feel very old.